Julianne of Outlandish Lit sent me this ebook along with a some other strange titles. 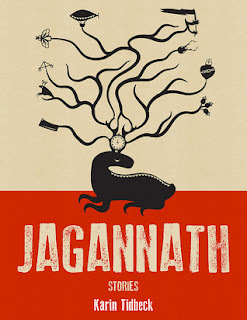 Jagannath was the first one I read. I need to give Julianne a huge THANK YOU. This was so good! Swedish science fiction writer Karin Tidbeck translated her own stories for the English market. These stories have appeared in various publications, but are collected here under one title. They are all seriously weird. Here's a sampling of my favorites. The stories defy categorization. They are a little bit science fiction, fantasy, steampunk, and even folklore. Folklore is my jam! I'm always reading local folklore books (on witches and werewolves, for example). 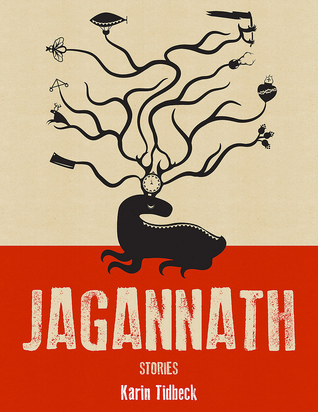 There is Swedish folklore in Jagannath, like the vittra in "Reindeer Mountain". One story titled "Pyret" is a fake academic paper about a fake mythical beast. The Pyret is a gelatinous shapeshifter that the author traces from ancient documents to the present time. The author even explores the site of the last documented encounter with a Pyret with creepy results. I liked the tone of the story, the academic detachment, the "research" and the spooky conclusion. I could have read a whole book like that. Not only did I enjoy the weirdness of the short stories but the honest emotion in so many of the ones about family. No matter how strange the events in the stories were there was no doubt that real human feelings were involved. So, yes, I LOVED Jagannath! Put it on your TBR list. I'm glad you loved it but that's probably not for me. Your post about this on Litsy made me really want to read this - it sounds so good!